When I got this submission a few months back I loved the subtle color palette, which I think is very subtle and peaceful, perfect to be creative in. To see more photos of Chris studio click here, or here for the main page of her blog. Congrats Chris...is a nice studio! Gorgeous, I just love the relaxing colour scheme. 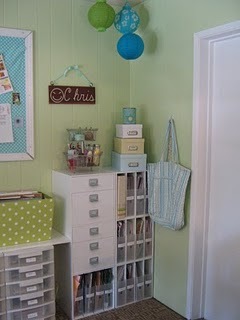 Amy's Awesome Paper Storage Idea!